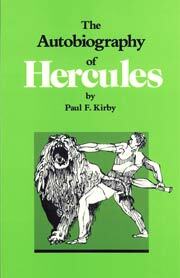 Hercules, with all the attributes of a classical hero (i.e., virgin birth, danger in childhood, trip(s) to fantastic places, descent to the underworld, thaumaturgy, closeness to a deity, philanthropic orientation, and final death followed by deification) is the subject of Professor Kirby's story developed in the first person to inform and delight all of us interested in this classical hero who represents the universal aspirations of the mortal human race and foreshadows the euhemeristic attributes of Christ. The egregious value of this book is its fullness in the retelling of the typical hero-attributes. As such this book should be used in our mythology courses as a gentle but effective introduction to the mythological world-view that characterized the ancient world and developed into the roots of our western religion(s). Its value also lies in the fact that the scattered pieces of the myth of Hercules are gathered in Kirby's book into a meaningful sequence by the glue of imagination. The reader, therefore, who already knows some of the story will find pleasure in learning the complete tale. The student meeting Hercules for the first time will experience the thrills of his adventure, the agony of his struggles, the tragedy of his death, and the glory of his ultimate triumph in deification.